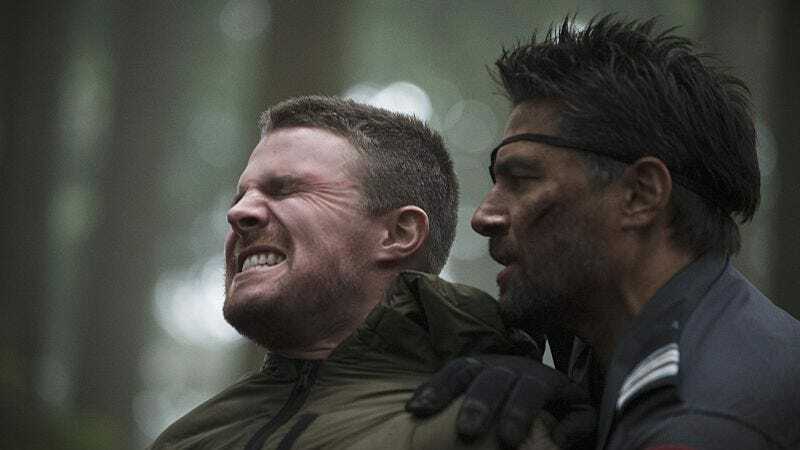 I won’t pretend I really know what to make of an episode like “The Return.” Even at its best, Arrow is a show unafraid to drench itself in pulp and bombast. In keeping with its comic book roots, this is a show that embraces outsize storytelling and big, melodramatic plot beats. Honestly, it’s probably more surprising that Arrow ever lands a serious moment than that it churns out something as ridiculous as the flashback portions of tonight’s episode. The show takes the unique situation of having past Oliver come back to Starling City as an opportunity to explore where its characters were five years ago, in the ancient, long-forgotten year of … holy crap, is that supposed to be 2010!? Unavoidably, some of this is going to be fan service, but the show can justify such indulgences as long as at least some of what we learn is something more substantial. 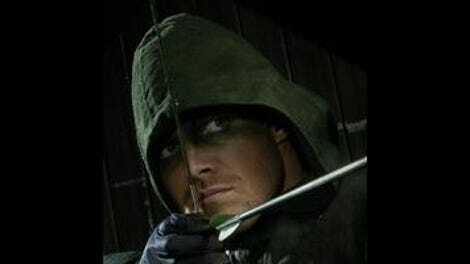 From a simple standpoint of narrative accountancy, it’s at least useful to have Oliver take a big step toward picking up the list, and his vicious attack on that drug dealer is as good a point as any to declare the initial separation of the Hood from Oliver Queen, trained killer. It’s trickier to say that “The Return” really lands any of its ostensible character beats in the flashbacks. The episode comes closest with Detective Lance, if only because these subplots tend to have smaller stakes and be more straightforward in the telling. In both the past and the present, Lance is about as low as he could possibly get. In 2010, he’s hiding inside a bottle, firing wildly at anyone he even remotely associates with the death of his daughter and the failure of his marriage. By 2015, his anger has been replaced by an abject despair, to the point that I’m not sure that he could escape it even if he did start drinking again. In both cases, though, Lance’s turmoil is less about Sara than it is about Laurel. He relies on his older daughter because theirs was always the closest bond in the family; in both years, nothing can really dull the pain of losing Sara, but the knowledge that he still has Laurel is what gives him the strength to continue. The first time around, Laurel betrayed this thoughtlessly, by opting to take a job far away, not only from Starling City but also from what she set out to do. It was a mistake, but one easily rectified. Her transgression in the here and now is far worse, because it’s shattered their bond, quite possibly beyond the point of repair. As for the story of Oliver and Thea: Well, the island scenes certainly do their fair share of the heavy lifting, and we’ll get back to them in a moment. There’s room in the flashbacks to show us something new about Thea, perhaps to reveal an embryonic form of the resolve and self-reliance that Malcolm and now Oliver have cultivated. Instead, what we get is basically just a return to season one Thea, wig and all. (Seriously, the wig game in this episode is fierce, though I’m most excited by the possibility that Tommy is sporting Colin Donnell’s actual hair.) She’s the same lost, confused hellion we met back in the show’s early days, and that points to the recurring issue with the flashbacks in “The Return.” Arrow doesn’t appear interested in revealing any shocking twists to its established characters’ backstories—honestly, just depicting Lance as an actual alcoholic is about the closest the episode gets to something revelatory—and it can’t plausibly have Oliver interact with any of the characters beyond the odd stolen glance. What this all means is that, as is so often the case on Arrow, the character development is massively tilted toward Oliver. He’s the only one who really gets to learn something from the flashbacks, and it’s not a coincidence that he has by far the least ridiculous character beat in the past, namely when he rebuffs Maseo’s suggestion that his family would be ashamed of his selfish decision by matter-of-factly declaring they are already ashamed of him. But beyond that? We’re mostly stuck ticking off boxes on fan service checklists. There’s the secret origin of Tommy and Laurel’s relationship, which was kind of a big deal back in 2013! There’s Felicity, having her first awkward, prattling flirt with a picture of Oliver! There’s Roger Cross, back for a random but welcome cameo as Lance’s dead partner, Lucas Hilton! And, most significantly, there’s our first glimpse of Andy Diggle, as he and John work security for Tommy’s partner and awkwardly reference Lyla and military service. The conversations we get here manage to be both superficial and on-the-nose, yet there’s something about their unrestrained cheese that I kind of love. Better shows could have handled similar materials with far more sophistication, extracting little moments of significance from the characters’ interactions that could echo forward to the present. Hell, sometimes that better show is Arrow itself. But tonight’s flashbacks represented the best worst episode of Arrow I’ve ever seen, and that’s something to celebrate on its own paradoxical terms. Meanwhile, Slade Wilson represents yet another meaning for the episode’s title, as Malcolm springs a trap that would be appallingly psychotic for anyone else but is just another Wednesday for him. Manu Bennett instantly reminds us why he’s such an asset to the show; yes, he’s quite good at the snarling villainy, but he can also bring out subtler emotional hues. His final conversation with Oliver nearly saves the episode all by itself: He never quite relinquishes his adversarial role, yet he talks to Oliver more as an old friend and comrade, noting the darkness that is descending around Thea and the lengths Malcolm went to in order to engineer that fate. The scene neatly illustrates how Malcolm and Slade’s strains of insanity differ, even if both are ultimately rooted in anguish for a lost love. Slade is consumed by rage to the point that he can no longer think clearly, yet it’s still possible for the fog to clear, if only for those brief moments. He’s not the old Slade in that final scene, because it’s apparent that his hatred of Oliver has not abated. But his final question—“How many people can Oliver Queen lose before there is no more Oliver Queen?”—is far more pointed because it plays as something more than just a petty bit of psychological needling. As for Malcolm, he too was consumed by rage, but the difference is that the League of Assassins helped him bring order and discipline to his anger. That breeds a far more dangerous kind of insanity, because it effectively encases in his own mind all the hatreds and sorrows that he might otherwise have someday dealt with. That’s how you take the callow businessman we met a couple episodes back and create the monster he is now. Thea’s final, absolute recognition that this man is no kind of father is just the latest crucial step in her growth; her time with Malcolm could feel like a narrative cul-de-sac, but he did train her to be the kind of person who could survive on the island, the kind of person who could endure not just Slade Wilson’s attacks but also the crushing revelation of her unwitting role in Sara’s death. A lot of “The Return” is ridiculous, pushing right at the outer limits of the crap I’m prepared to let Arrow get away with, but still: Whenever the show focuses on the relationship between Oliver and Thea, everything has a way of snapping back into place. Much as I’m sad that Tommy and his incredible jacket-polo combo won’t be hanging around for the rest of the season, that sibling story is rather more likely to carry Arrow over this season’s finish line. “What kind of psycho would put that thing there?” “Me.” Well, I think we all know what the flashback plot of season five is going to entail. So many booby traps! “Yeah, I pulled the hoodie down over my face.” “That disguise wouldn’t work if you had greasepaint all over your face.” In an episode brimming with on-the-nose lines, that one might be the most shameless. Not coincidentally, it might be my favorite. So, so dumb. “There’s one other inmate, he’s not going to be very helpful.” I don’t believe we know who this inmate is, right? So, start speculating away! Update: And, as many of you have pointed out, the second inmate is Captain Boomerang. Man, there’s a lot to keep track of on these shows.